As part of the festivities marking the 20th edition of the Essaouira Gnaoua and World Music Festival to be held in Essaouira from June 29 - July 1, the major Gnaoua (sometimes spelled Gnawa) maalems are setting out to conquer the American and French audiences. The Gnaoua Festival Tour will take place from March 16 - March 27, 2017 upon the initiative of the Yerma Gnaoua Association and the organizers of the Festival who have been endeavoring for several years to promote and safeguard this ancestral culture. The Gnaoua Festival Tour will gather some of the greatest Moroccan Gnaoua maalems and jazz & world musicians to perform in New York, Washington and Paris. On the eve of the 20th edition of this Festival, which has transformed the Moroccan cultural landscape, we want this significant part of our culture to have even greater international resonance. This will be made possible thanks to this tour stopping at three major cities: New York, Washington, and Paris in Spring of 2017. 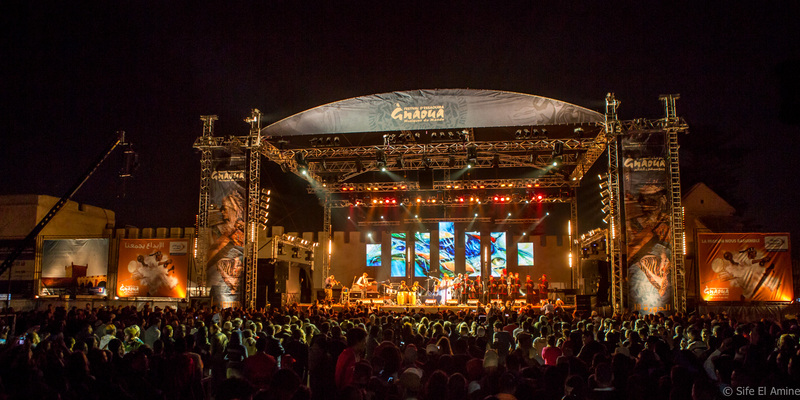 At each phase, exceptional musicians will join the Gnaoua on stage to merge their musical universes in harmony with the spirit of the festival. “In 20 years, we have come a long way, and we wish to recall to what point, and beyond the cultural dimension, the Essaouira Gnaoua and World Music Festival has disclosed the face of a new Morocco, authentic and modern at the same time, specific and universal, and resolutely African," says Neila Tazi, Producer of the Gnaoua and World Music Festival, and Founding Member and Deputy President of the Yerma Gnaoua Association. During the tour, the Gnaoua maalems will first perform their traditional repertory, before sharing the stage with internationally renowned artists for collaborative sets. The Gnaoua Festival Tour will start in New York on March 16, 2017 at Lincoln Center, then will fly to Washington to perform on March 18 at the Kennedy Center, before travelling back to New York for the last concert at Brooklyn Pioneer Works on March 19. In these concert halls, the Gnaoua maalem Hamid El Kasri and Abdeslam Alikkane will perform alongside Karim Ziad, Will Calhoun, Jamaaledeen Tacuma, Shahin Shahida and Humayun Khan. After the United States, it is in Paris, on March 27 at the Bataclan that maalems Mustapha Baqbou and Hassan Boussou will perform along with Tony Allen, Hindi Zahra, Titi Robin, Mehdi Nassouli and Karim Ziad. During these intensive weeks of encounters, the Gnaoua Festival Tour seeks to promote even further the Essaouira Gnaoua and World Music Festival and Gnaoua culture at the international level. It is a culture conveying messages of peace and tolerance, of sharing and mutual respect. The Gnaoua Festival World Tour 2017 is presented by the Yerma Gnaoua Association and The Essaouira Gnaoua and World Music Festival. The tour is made possible thanks to the official sponsorship of OCP, the partnership of TV5MONDE Group, and with the support of the Moroccan Embassies in France and the USA, and the support of Momex. The Gnaoua fraternity was constituted from populations originating from Black Africa, mainly comprised of slaves and their descendants. Gnaoua are a fraternity practicing ritual possession of a mystical and therapeutic nature which might have been inherited from sub-Saharian animist cults. and knowledgeable Gnaoua, music and Gnaoua rituals would share common origins with Voodoo, Cuban Santeria and Brazilian Candomblé. These practices then evolved adapting to their local settings to ensure continuity. Gnaoua, masters and disciples, black and white, men and women, all live this cultural, artistic and spiritual experience both through the practice of ritual expressions as well as in everyday life in general. The Gnaoua setting consists of master musicians, instrument players (three-string guembri lute, qarqabu metal castanets, tbal drum), fortune-telling therapists (chouwafate), mediums and simple followers. Together they practice a syncretic possession rite (called lila de derdeba), which combines at the same time the cultural contributions of Black Africa, the Arab-Muslim civilization which came from the East as well as the indigenous Berber cultures. During the lila, the adepts take part in rites of possession.